According to a letter seen by TorrentFreak, Google are threatening action against one of the web's largest YouTube conversion sites. The site, which according to Google's own stats is pulling in 1.3 million visitors every day, extracts MP3 audio from YouTube videos and makes it available for users to download. Google's lawyers say this must stop, and have given the site seven days to comply. YouTube is without doubt the biggest free resource of videos and music available online today. It can be enjoyed on the site itself, embedded in any webpage, or accessed via YouTube’s Application Programming Interface. This API, as it’s better known, provides web developers with access to certain YouTube features, but like many free gifts it comes with certain strings attached, aka the YouTube Terms of Service (ToS). One of the countless resources to use the YouTube API is YouTube-MP3.org, a huge site which according to Google’s DoubleClick service pulls in 1.3 million visitors every day. What YouTube-MP3 does is straightforward. At one end a user feeds the site with a YouTube URL and after a couple of minutes the site spits out a standalone MP3 file, perfect for ripping the audio from pop videos. Furthermore, Cohen underlines the fact that to “separate, isolate, or modify the audio or video components of any YouTube audiovisual content made available through the YouTube API” is forbidden, as is externally storing copies of YouTube content. Continuing to violate these restrictions, Cohen warns, may result in “legal consequences” for YouTube-mp3. The site has been given seven days to comply. Speaking with TorrentFreak, Philip told us that he sent a long response to Cohen providing him with details on YouTube-MP3, how the site services tens of millions of users, and asking for a call with YouTube to discuss the matter further. YouTube, however, doesn’t appear to be in the mood for negotiation. Google has just blocked all of YouTube-MP3’s servers from accessing YouTube so currently the site has no MP3 download service to offer or indeed withdraw. “We would estimate that there are roughly 200 million people across the world that make use of services like ours and Google doesn’t just ignore all those people, they are about to criminalize them. With the way they are interpreting and creating their ToS every one of those 200 million users is threatened to be sued by Google,” Philip adds. Not surprisingly Google sees things from a different perspective. It says that part of its responsibility to people uploading content to YouTube is to give them tools to manage how their content is shared, monetized and generally displayed. Some of those content owners, including the major record labels, frown on their music videos being used as a source for unauthorized MP3s, so they will welcome YouTube’s approach. Whether they prompted the action in the first instance is unknown. Whatever the outcome in the case of YouTube-MP3, Google has a big task ahead if it is to end all similar services online. A simple search for “YouTube MP3” with its own engine produces dozens of alternatives. Just last year the world’s largest record labels sued another YouTube downloader site but getting Google to do the work at its root is probably much less costly. Update: We have just been informed that Google may be targeting other similar services with the same message. If your site is affected, please contact us at the usual address. Update2: The owner of YouTube-MP3 has just informed us that his site does not use the API, but obtains videos by other means. 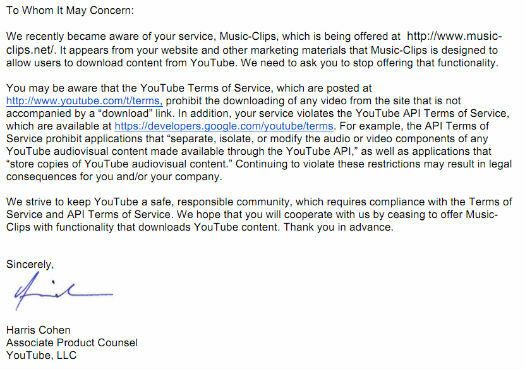 Update3: Music-Clips.net received a letter from Google as well. c There are 341 comments. Add yours?